If you haven’t heard of a drop veil, I’m sure you’ve seen Kate Middleton’s wedding veil. A drop veil is a style of veil made famous by Grace Kelly or most recently Kate Middleton at the Royal Wedding. Drop veils are also known as circle veils and they have made a beautiful resurgence over the past few years with many vintage-inspired brides choosing a drop veil rather than a traditional gathered veil. This beautiful style of veil is designed to sit over the face during the wedding ceremony and then pulled back to create a two layered veil. It’s the perfect style if you want to add a sense of formality to your wedding whilst staying classically chic. A drop veil features no gathers at the crown and drapes beautifully to create a classic and ethereal look. And, once positioned in place, there’s only two things left for the groom to do: lift and kiss! There’s a few different ways to secure a drop veil so I thought I would create a short video to share some tips on my 3 favourite options. I’d love to know if you have a favourite! You might be wondering why a drop veil can’t be secured with a standard comb? Well, it can! And often it does, but depending on the designer who created your drop veil and where you purchase it from, it can sometimes come with no attachment at all. But don’t worry, there’s a good reason for it – drop veils come in a wide range of different lengths and they can be worn in a bridal updo, half up half down hairstyles and also loose curls. Due to the very versatile nature of a drop veil, it is often difficult to create a drop veil with a comb already attached in a standard position because it depends on your hairstyle, your height and also, any headpieces you might be wearing with it. For example, if you are tall, the position of the comb will be very different to someone who is shorter because the point to which it falls to (it should fall to the inside of your elbow so your bouquet won’t be covered) will vary greatly. 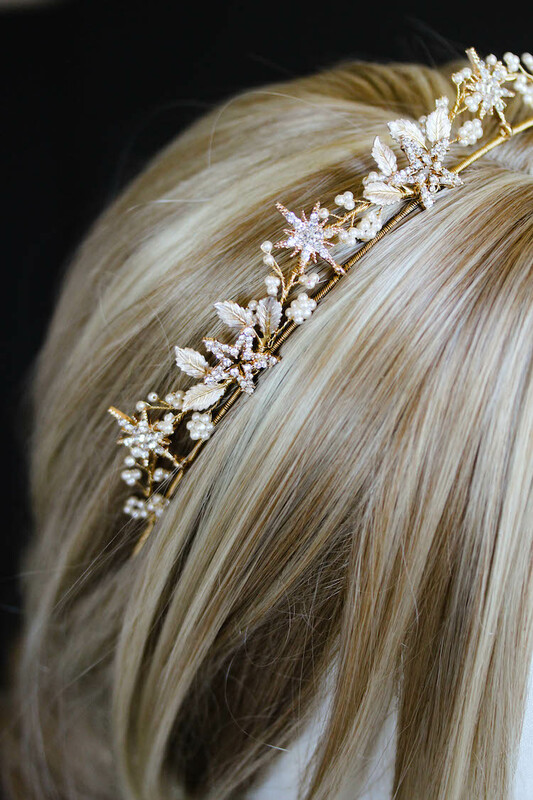 Also, if you decide to wear a tiara with your drop veil, you might find that hair pins or hat pins will work better in your hair than a comb, as you can simply hide the pins underneath the tiara. Often when I create a drop veil for a bride, I like to ask a few questions ahead of time including the height of my bride, what her hairstyle will look like (specifically if she will be securing her drop veil into a high bun vs low bun) and also the amount of volume she’ll have in her hair. All very practical questions which will ensure that if I secure a comb to her veil, it will fall perfectly! I’d love to hear your thoughts on these techniques – and, if you have any tips you’d like to share also, please leave them below! If you also know of any brides who will be wearing a drop veil on their wedding day, please share this video with them! It’s always useful to know how things are done so you can make adjustments to the veil on the wedding day as needed. Please also subscribe to the Percy Handmade Youtube channel to watch new videos as I post them!